Concert-News!! Michel Montecrossa’s ‘Life For All’ Cyberrock & Climate Change Concert on 2.05.2009 at the Michel Montecrossa Rock Vision Diner in Gauting near Munich will be the next concert of the ongoing ‘Courage & Love Climate Change Concert Tour‘!! The concert by Michel Montecrossa and his band The Chosen Few starting at 10:00 p.m. goes along with an exhibition of his visionary paintings, drawings and Cyberart. The event will be introduced at 9:00 p.m. by Michel Montecrossa’s powerful movie ‘Reality Rocker, Part 3 – ‘World Of Man Creature’. on Saturday, the 2nd, May 2009, from 8:30 p.m. – 1:00 a.m. Konzert-News!!! Neueste Cyberrock und Climate Change Songs von Michel Montecrossa’s ‘Courage & Love Climate Change Concert Tour’ gibt’s am 2.05.2009 im Michel Montecrossa Rock Vision Diner in Gauting (Nähe München) beim ‘Life For All’ Cyberrock & Climate Change Concert. Das Konzert von Michel Montecrossa and his band The Chosen Few wird um 22:00 Uhr beginnen und von einer Ausstellung, die Michel Montecrossa’s visionären Gemälde, Zeichnungen und Cyberart präsentiert, begleitet werden (hier ein Vorgeschmack: Michel Montecrossa Gallery ) Um 20:30 Uhr gibt es zur Eröffnung des Events Michel Montecrossa’s Rock-Cinema Meisterwerk ‘Reality Rocker, Part 3′. 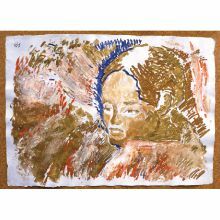 Michel Montecrossa’s Gallery is online!!!! 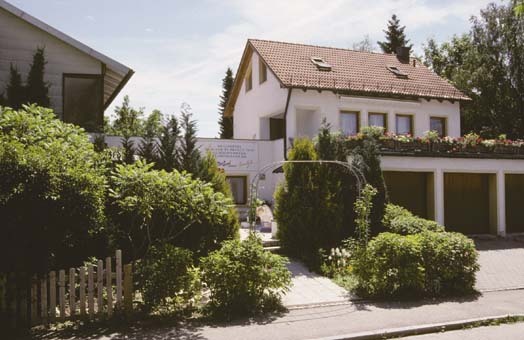 You can visit permanent Michel Montecrossa Art Exhibitions in Mirapuri, Italy and the Filmaur Multimedia House in Gauting, Germany. 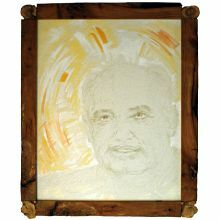 Michel Montecrossa Paintings, Drawings and Cyberart are available as framed Digital Art Images with original signature for 850 Euro each at the permanent Michel Montecrossa Art Exhibitions in Mirapuri, Italy and the Filmaur Multimedia House in Gauting, Germany. Unity Is Cool – Michel Montecrossa presents next Live-Concert CD!! 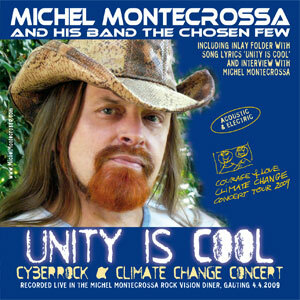 The ‘Unity Is Cool’ Cyberrock & Climate Change Concert, released by Mira Sound Germany as double Audio-CD and DVD is Michel Montecrossa’s seventh concert of the Courage & Love Climate Change Concert Tour 2009 presenting 36 songs, including the acoustic version of ‘Love Unites‘, the title song ‘Unity Is Cool‘, the celtic style ‘Earthpower Trek‘ and the acoustic ‘Earth Story Song‘. Mirakali and Diana Antara contribute world union songs like ‘Ocean‘ and ‘Lovepower‘. CD-Neuveröffentlichung: ‘Unity Is Cool’ – Michel Montecrossa präsentiert auf der siebten Live-CD seiner ‘Courage & Love Climate Change Concert Tour 2009’ 36 Songs, darunter u.a. die Akustik Version von ‘Love Unites‘, das Titel-Lied ‘Unity Is Cool‘, der Celtic Style Song ‘Earthpower Trek‘ und der akustische ‘Earth Story Song‘. Mirakali und Diana Antara präsentieren eigene World Union Songs, u.a. ‘Ocean‘ und ‘Lovepower‘. Michel & Bob Dylan Fest 2009 Poster!! Love Unites – 6th CD of Michel Montecrossa’s ‘Courage & Love Climate Change Concert Tour’ out now!! The ‘Love Unites’ Cyberrock & Climate Change Concert, released by Mira Sound Germany as double Audio-CD and DVD is Michel Montecrossa’s sixth concert of the Courage & Love Climate Change Concert Tour 2009 presenting 33 songs, including the celtic style title song ‘Love Unites‘, the electro acoustic version of ‘Future Love Dance‘ and the wild rock ‘n’ rollers ‘Keep On Lovin’‘ and ‘Hot And Wet‘. Mirakali and Diana Antara contribute new style love songs like ‘Fight For You Love‘ and ‘Happy Life Of Love‘. 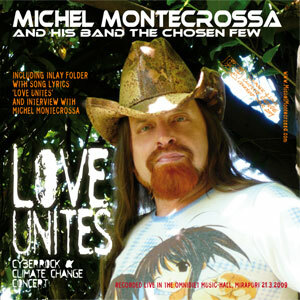 CD-Neuveröffentlichung: ‘Love Unites’ – die sechste CD von Michel Montecrossa’s Courage & Love Climate Change Concert Tour 2009′ präsentiert 33 Songs; mit dabei der Celtic Style Song ‘Love Unites‘, die Electro Acoustic Version von ‘Future Love Dance‘ und Vollgas Rock ‘n’ Roller ‘Keep On Lovin’‘ sowie ‘Hot And Wet‘. Feminine Music Power in New Style Love Songs wie Mirakali’s ‘Fight For You Love‘ und Diana Antara’s ‘Happy Life Of Love‘. Weitere Infos siehe int. Pressemeldung weiter oben. Concert-News!!! For more groovy Cyberrock, finest Unplugged songs, dazzling Electronica & wild Guitar-Action by Michel Montecrossa www.MichelMontecrossa.com, Mirakali and Diana Antara you shouldn’t miss the ‘Global Message’ Cyberrock & Climate Change Concert on 25.04.09 at the Omnidiet Music-Hall www.Omnidiet-Hotel.com . 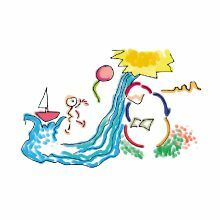 The concert goes along with an art-exhibition of Michel Montecrossa’s drawings and Digital-Art. 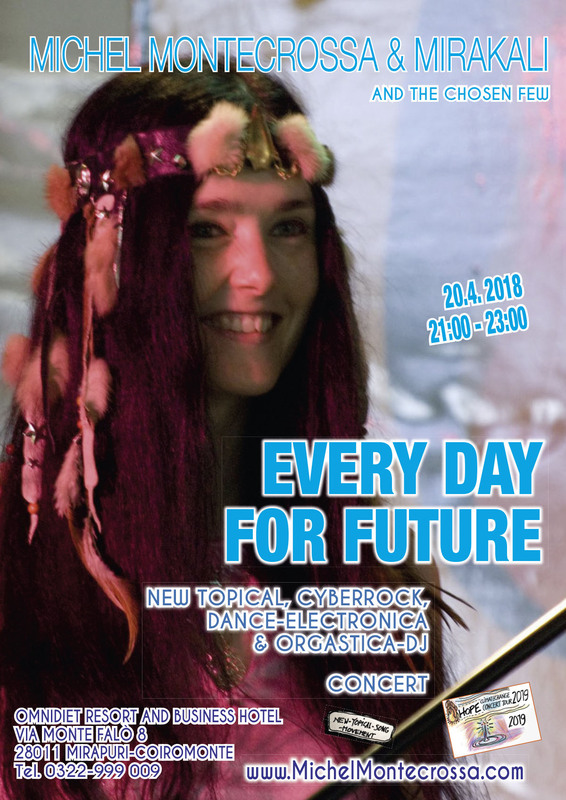 Cyberrock Konzert-News!! Am Samstag, den 25.04.2009 geht Michel Montecrossa‘s ‘Courage & Love Climate Change Tour 2009′ mit dem ‘Global Message’ Cyberrock & Climate Change Concert weiter, das in der legendären Music-Hall der Künstleroase ‘Omnidiet’ stattfinden wird www.Omnidiet-Hotel.com . Ob Unplugged, mit sattem Guitar-Drive oder visionären Electronica-Songs:die Musik von Michel Montecrossa, Mirakali und Diana Antara steht für Virtuosität, energiegeladene Live-Action und intelligente ‘Direct Talking’ Songs. Zusätzlich zum Konzert gibt es eine Ausstellung von Michel Montecrossa’s Zeichnungen und Digital Art. Michel Montecrossa & Diana Antara ‘Bright Galaxy’ is released by Mira Sound Germany as Audio-CD with 10 instrumental sound tracks. ‘Bright Galaxy’ presents a contemplative soundscape journey through relaxing instrumental melodies and orchestral wellness moods including the title tune ‘Bright Galaxy‘ and the finale ‘World Ocean‘. 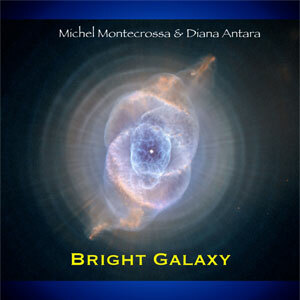 ‘Bright Galaxy’ – die neue orchestrale CD von Michel Montecrossa und Diana Antara. 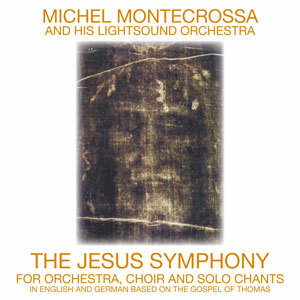 Michel Montecrossa‘s profound ‘The Jesus Symphony’ released by Mira Sound Germany as Audio-CD with 6 orchestral and 5 solo chant tracks is dedicated to the life and message of Jesus. Michel Montecrossa has written the lyrics of the song-chants on the basis of the Gospel of Thomas. ‘The Jesus Symphony’ is performed by Michel Montecrossa and his Lightsound Orchestra. The vocals are performed in English and German by Michel Montecrossa. 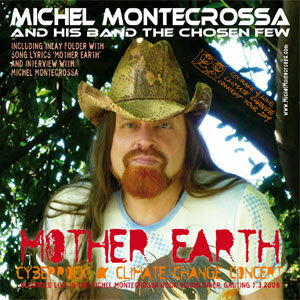 The ‘Mother Earth’ Cyberrock & Climate Change Concert, released by Mira Sound Germany as double Audio-CD and DVD is Michel Montecrossa‘s fifth concert of the Courage & Love Climate Change Concert Tour 2009 presenting 37 songs, including the acoustic ‘Earth Story Song‘, the title song ‘Mother Earth‘ and a great electro-acoustic version of the ‘Earth Mystery Song‘. Mirakali and Diana Antara contribute mother earth songs like ‘The Heart That Beats Like Yours‘ and ‘Earthdance‘. 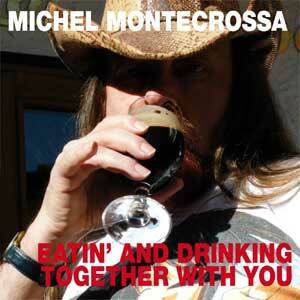 Michel Montecrossa‘s ‘Eatin’ And Drinking Together With You‘ acoustic song is a great special Maxi-Single release by Mira Sound Germany recorded on the road of the ‘Courage & Love Climate Change Concert Tour 2009’, featuring three versions of the song: ‘Acoustic Solo Version‘, ‘Acoustic & Accordion Version‘ and ‘Acoustic & Band Version‘. I’m eatin’ and I’m drinking, I’m havin’ a good time. I’m eatin’ and am drinking for havin’ a good time. Sometimes I’m a-hungry and sometimes I’m a-dry. Then I’m eatin’ and drinking together with you. and we have a good time, yeah, that’s what we do. Eatin’ and drinking takes away the blues. and with you I always know what to do. In the morning I see you and your eyes are bright. and wherever we travel, we know what is right. and together we know our appetite.